Check these eight amazing action figures based on the Walking Dead TV and comics series. From its first episode, AMC's The Walking Dead has become one of the most popular TV shows. Its gritty content, drama plots and constant surprises hold viewers glued to the screen more than any other TV show manages to do. If you are one of millions of fans crazy about Rick and his group of courageous survivors who roam in a world populated with zombies, you will love these Walking Dead action figures created by McFarlane toys. Rick Grimes is a police officer who had been shot just before the Zombie apocalypse happened. When he woke up from coma, he found out that the world had changed. Ever since then, his life has been a nightmare sprinkled with tiny moments of joy. His family is all he has and, as we saw in Season 2, he is ready to do anything (kill anybody) to protect those he loves the most. McFarlane toys have created two Rick Grimes figures. One is based on the TV show character and the other on the comic books. The first figure has features similar to those of the actor Andrew Lincoln (who portrays Rick in the TV show). The other one is slightly different: Comic-book Rick has longer hair and different police clothes. Both of these Walking Dead action figures come with a whole set of additional pieces like shotguns, bags, etc. Michonne is one of the most dangerous characters in the comic book series. She is explosive, skillful with swords and indifferent to horror around her. And she is one of Rick's best friends. In the TV show, Michonne first appeared at the end of Season 2, when she saved Andrea (yes, Michonne is that mysterious person with a hood covering her face). When he first appeared in Season 1 of the Walking Dead, Daryl seemed as a copy of his evil brother. But as the story progressed, it became obvious that behind the rough surface is a man with a good heart who will be there when you need him the most. Without him, Rick's group would have much lower chances of survival. 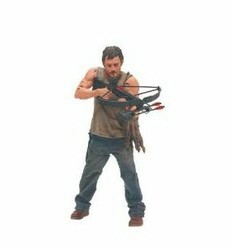 His crossbow is as deadly as Michonne's sword. What would be the Walking Dead action figure collection without those ugly creatures. Luckily, McFarlane toys have made sure that there are plenty of different zombie figures for the fans to choose from. Fat, skinny, well dressed and with an axe slammed on its head... Pick the one that fits your room the best. Make sure to check all the cool features that every zombie has (removable limbs, exploding head, to name a few). Do you need a Walking Dead poster for your room?